SANTA MONICA, CALIF. (May 2, 2016) – – The highly anticipated co-main event of “Bellator 154: Davis vs. King Mo” between Josh Thomson (22-8, 1 NC) and Michael Chandler (14-3) will have to wait, as it has been removed from the card after Thomson sustained an injury during training camp over the weekend. In place of the Thomson-Chandler matchup, two newly-signed main card bouts have been added to the televised portion of “Bellator 154: Davis vs. King Mo” at the SAP Center in San Jose on May 14. Sergei Kharitonov (23-5) will meet Josh “The Juggernaut” Appelt (12-5), and Andre Fialho (6-0) has agreed to fight Rick Reger(7-1). These matchups join a huge main event between light heavyweight headliners “King Mo” (19-4, 1 NC) and Phil “Mr. Wonderful” Davis (15-3, 1 NC), who will duke it out to determine the No. 1 contender for Liam McGeary’s title. With the injury to Thomson and the Jordan Parsons tragedy that forced the cancellation of his fight with Adam Piccolotti, “Bellator 154: Davis vs. King Mo” will soon receive an additional two bouts to round out the five-fight event. 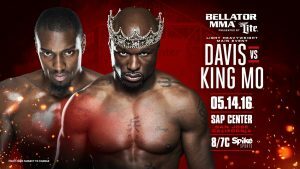 “Bellator 154: Davis vs. King Mo” takes place on May 14, and airs LIVE and FREE on SPIKE at 8 p.m. ET/7 p.m. CT while the preliminary card will stream live on Bellator.com and The Bellator Mobile App beginning at 6:30 p.m. ET. Tickets start at just $30 and are on sale now at Bellator.com, Ticketmaster, and the SAP Center Box Office. Russian heavyweight Sergei Kharitonov is yet another high-profile free agent that has chosen to take his talents to Bellator MMA. The 35-year-old is currently riding a five-fight winning streak, dating back almost four years, including four consecutive knockouts. Kharitonov also holds victories over some of the sport’s most notable names, including current UFC Heavyweight Champion Fabricio Werdum, Andrei Arlovski, Pedro Rizzo, and Alistair Overeem. Riding momentum from his last outing, which saw the Moscow native deliver a first-round KO, Kharitonov is looking to replicate that success during his bout on May 14. A veteran of promotions such as PRIDE Fighting Championships, STRIKEFORCE and DREAM, Kharitonov now makes his eagerly-anticipated debut in Bellator MMA’s increasingly impressive heavyweight division. Josh Appelt will be returning to Bellator MMA for the first time since April 2014, when he left the promotion after going 3-1 over the course of a three-year run. “The Juggernaut” made his debut against Ed Carpenter in November 2012 at “Bellator 79,” emerging victorious after submitting his opponent in the first round. Born just north of San Jose, the Olivehurst, Calif. native will look to put on a show for his hometown fans when he steps into the cage at the SAP Center. Appelt hopes to build off of his current two-fight winning streak, including a spectacular knockout victory over Roy Boughton in his last outing earlier this year. Rick Reger will be making his Bellator MMA debut, after spending the first five years of his professional career fighting primarily with Gladiator Challenge. “Boomer” made his professional debut in 2011 and never looked back, winning each of his first six professional fights and seven of eight total, including his most recent knockout victory over Tramain Smith. The 29-year-old submission specialist has honed his craft under the watchful eye of Cesar Gracie, the same man who is responsible for the success of guys like Nick and Nate Diaz, Gilbert Melendez and Jake Shields. Reger will have his hands full on May 14, when he takes on the much younger Andre Fialho in welterweight action. The undefeated Andre Fialho will enter the cage having won his first six career fights, including five consecutive knockouts. Four of the Portuguese fighter’s five knockouts have taken place in the first round with three of those finishing blows coming one minute or less after the opening bell. 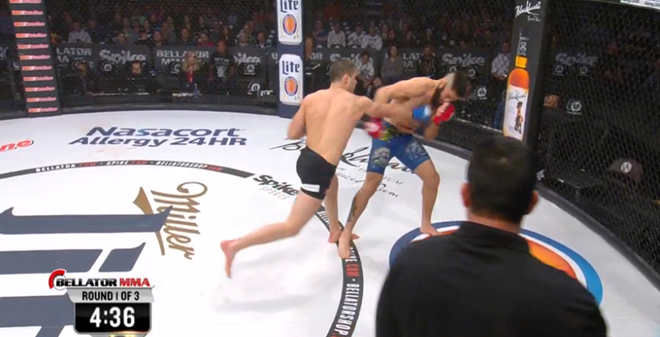 His most recent victory, a first round knockout of Manuel Meraz at “Bellator 150: Kongo vs. Spartan,” was the quickest finish of Fialho’s career, ending the bout just 29 seconds into the opening frame. The 22-year-old will be making his second appearance with Bellator MMA and hopes to continue on his rapid pace to becoming one of the welterweight division’s top fighters. Click the image below to watch Fialho’s last outing.